PediaSure® is a nutritional supplement that provides complete, balanced nutrition for children 2 years & above– those special years of rapid growth and development. 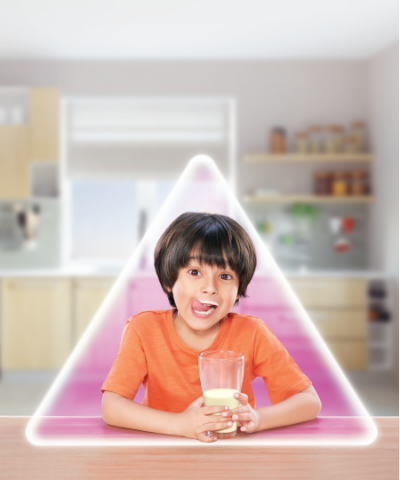 When consumed in proper amounts, PediaSure® is scientifically formulated to provide 100% of the recommended dietary allowance for Macro nutrients (Carbohydrates, proteins & fats) & micronutrients (Vitamins & Minerals) that are required for growth and development3. PediaSure® also contains FOS(fructo oligo sachharides) which is a prebiotics & Bifidobacterium and Lactobacillus acidophillus which are probiotics to support immunity. Formulated with 37 nutrients, PediaSure® is scientifically shown to help increase height and weight, reduce chances of infection & sick days*,4. PediaSure® also contains nutrients such as Taurine, Choline and Omega 3 & 6 fatty acids to help support brain development. *Less infection refers to less chance /incidence of upper respiratory tract infection. Depiction of growth. Growth here implies to weight and height. Results may vary in children at nutritional risk given nutritional counseling with or without nutritional supplementation for 90 days. 1)Alarcon P. Clin Pediatr.2003;42:209-217 ( ONS group consuming 40 mL/kg/day of PediaSure in addition to a normal diet) and 2)Shaikh I. Malaysian Journal of Nutrition, Vol 21, Suppl, Jan 2015. Pg S81 (Among children with upper respiratory infections).